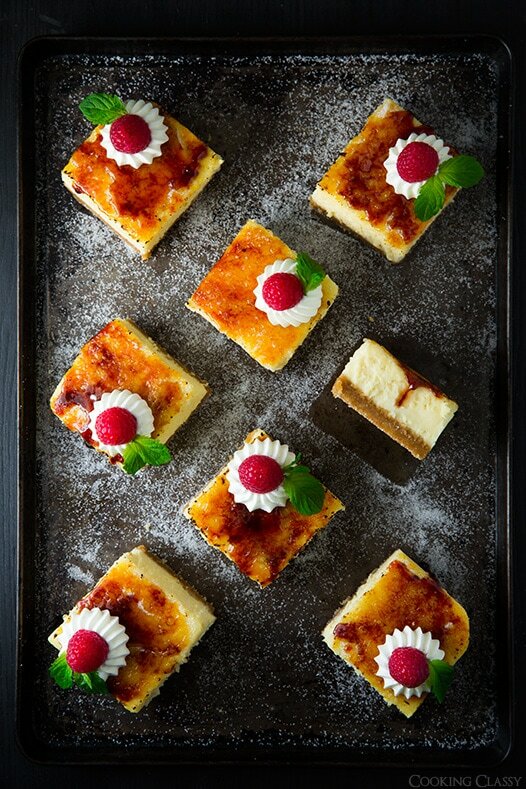 Two of the worlds best desserts come together to make these unbelievably delicious Crème Brûlée Cheesecake Bars. I don’t think I could express in words how much I love these things! They are a dream come true. Everything about them is absolutely amazing. The contrast of these bars is part of what makes them just so good. 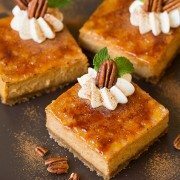 That brittle, perfectly caramelized, crunchy shell atop a silky smooth and richly creamy cheesecake, which rests over a slightly salty, slightly sweet, buttery graham cracker base that crumbles in your mouth with each bite. 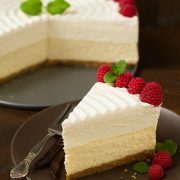 And then if you really want to go all out, top them with a little lightly sweetened whipped cream (because everything is good topped with a little cream) and then garnish them with fresh raspberries to add a layer of fresh flavor and a light tartness to compliment the tang of the cream cheese. If you’re like me, you will want to savor each and every last spec of it, and then hide rest from the world because sometimes it just to hard too share something so good :). If you don’t already own a culinary torch, here’s your reason to buy one. Enjoy! A perfectly rich and decadent cheesecake bar that's finished with a sweet caramelized sugar shell for that classic finishing brulee touch! A dessert that's sure to impress! Preheat oven to 350 degrees. Generously butter an 8 by 8-inch baking dish. In a mixing bowl, whisk together graham cracker crumbs and sugar. Pour in butter and use a fork to mix until evenly moistened. Press mixture into an even layer in prepared baking dish and bake in preheated oven for 10 minutes. Remove from oven and allow to cool while preparing filling. Reduce oven temperature to 325 degrees. In a mixing bowl, whisk together 3/4 cup granulated sugar with the flour. Add cream cheese to mixing bowl and using an electric hand mixer set on low speed, blend together cream cheese and granulated sugar mixture just until smooth, about 1 minute. Add in eggs one at a time and mix just until combined after each addition. Add heavy cream, sour cream and vanilla and blend just until combined. Tap bowl forcefully against countertop about 30 times to release air bubbles. Butter the side of the baking dish and pour filling over crust. Set the 8 by 8-inch baking dish into a 13 by 9-inch baking dish (a roasting pan would be fine too) and pour about 3 cups of hot water into the 13 by 9-inch baking dish (or enough water to make the water level reach halfway up the sides of the 8 by 8-inch dish. 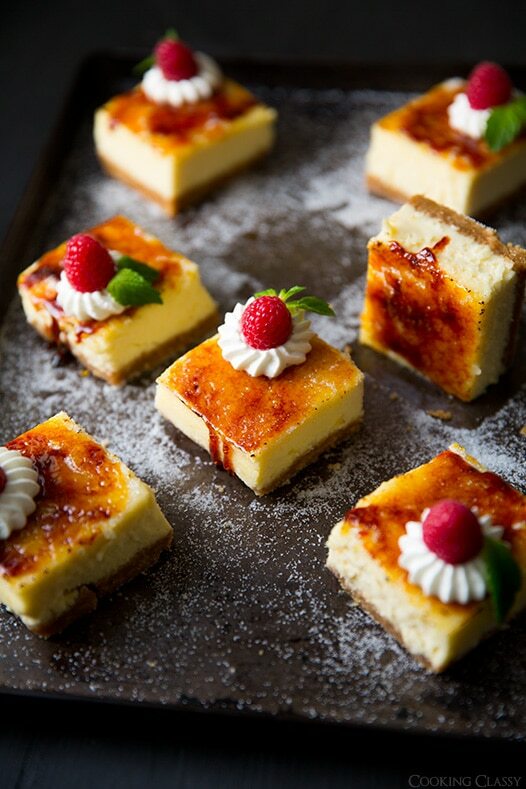 You are only pouring the water into the pan without the cheesecake in it, simply to create a water bath which will help the cheesecake cook more evenly and reduce the possibility of cracking). 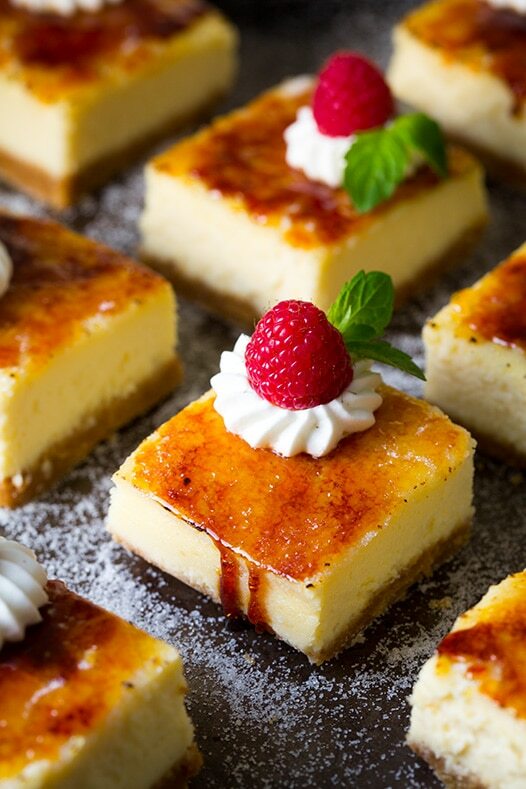 Bake in preheated oven until cheesecake is fairly jiggly, about 42 - 45 minutes, then turn oven off and allow cheesecake to rest in warm oven with door closed about 10 minutes longer or until center only slightly jiggles. Remove from oven and allow to cool on a wire rack at room temperature 1 hour, then cover and chill 4 hours. Cut bars into squares. Sprinkle each square with an even layer of sugar and melt sugar with a culinary torch (it will melt into beads then bubble, then caramelize and turn to a smooth surface). 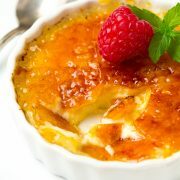 Allow topping to cool then pipe or spoon a small dollop of whipped cream over top, then add a raspberry and garnish with mint (garnish just before serving and melt sugar within several hours of serving for best results). Store in refrigerator in an airtight container.